Creativity with new methodology – literally thinking “outside the box”- is often required when housing artwork to conservation standards. Each piece of art is unique, and therefore needs housing that is suitable and customized to fit the needs of that individual work. 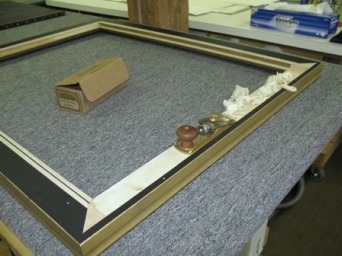 We recently worked with a painting, treated here by our conservation staff, that required the unique framing options our conservation framing department can offer. The painting was brought to us in a very fragile condition. It had previous overpaint, and a substantial lower third of the paint layer was lost. Our painting conservators repaired the losses in the head and neck areas, removed the old overpaint, and adjusted the varnish back to its original luster. However, we were still left with a lower third of the painting with numerous highly visible losses. At that time, our client elected not to have the bottom filled with gesso, textured, and inpainted. With this in mind, the client asked if we could physically remove the bottom third of the painting, which would remove the areas of loss, thus reformatting the original painting considerably. This request goes against our conservator’s code of ethics, which we explained, recommending to keep the painting intact to maintain the existing size of the canvas while choosing a frame molding that was wide enough to modify and accommodate covering the loss areas, only altering the window opening on the frame. Thus, we were able to preserve the existing work while accommodating the client’s aesthetic choice. Routing out the frame to accommodate the full painting, 39"x29"
We chose the oversized molding, routed and hand planed the bottom of the frame 2.25” to fit the original dimensions of the painting. An additional 1.5” of the frame was removed from the right side to cover losses along that bottom edge. The result was a creative option that both honored the aesthetic judgment and conservation standards. When ideals and standards are well coalesced, the preservation results can be very rewarding for future generations to enjoy. The client was extremely pleased with the outcome.